I love to travel light, but travel shoes are always a problem. I’ve tried to adhere to a one-pair policy, but it’s just not possible if I plan to keep fit, visit cold places, and trek in the wilderness. I’ve attempted to find an all-around travel shoe, but again, there’s nothing that remotely covers all seasons and all uses. In my quest to keep it light, I’ve finally realized that travel shoes involve some strategy. I found the perfect running shoe, the perfect hot weather shoe, but dealing with winter is still a problem. Do you buy a travel shoe that accommodates average winters and average summers? Or, do you buy a specific winter shoe just when you visit cold places? Last year we planned to climb Cerro Aconcagua, a mountain on the border of Argentina and Chile that towers almost 7,000m above sea level. The climb requires a hard-shelled mountaineering boot. 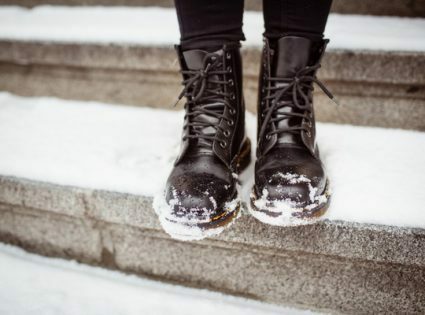 Not the sort of shoe you can wear casually around the house, but a boot that’s stiff, heavy and designed to keep frostbite at bay. The climb didn’t eventuate because we wanted to stay true to our quest of traveling freely and unencumbered. And so we made our first compromise relating to pack weight. If we wanted any hope of traveling lightly, we had to choose between agility, weight, bulk, safety, comfort, fashion, and utility. Summer is easy to cater for. And in fact, if you really want to travel light, it’s easier just to avoid alpine environments. In South East Asia, parts of South America, the Middle East, Africa, and other tropical climes, you can get away with a single pair of semi-open shoes. As a long-term traveler though, open shoes aren’t enough for exercise and adventure trips. That means I need at least two pairs of shoes. These semi-open travel shoes serve three functions: 1) they’re breathable for getting around casually in hot climates; 2) they’re ruggedized with a protective toe-cap for adventure trips; 3) they’re brown leather, so I can get away with them in less casual situations. You’ll be surprised how sturdy and protective they are. I’ve trekked and tramped all over the world with them; I’ve even walked through light snow cover in New York after I donated my pair of Scarpa boots to charity. The downside of all the protection is that they can get a little warm and they trap dirt and rocks, unlike a pair of flip-flops. But a far as versatility goes, these are by far the most comfortable and useful pair of travel shoes I’ve owned. Keen makes a huge range of travel shoes just like the Newport Bisons. But it’s the brown (or bison colored) leather that makes them semi-passable in less casual situations. With a nice pair of jeans, they can be worn to dinner, business meetings (we’re talking startups here) and anywhere that requires a little more conservatism. I’ve been in many situations where I would have been much less comfortable in Keen’s more colorful models. that would take up as little room as possible in my 32L Deuter backpack. I picked up a nice pair of Salomons and was on the way to the cash register when… I saw them. The salesman told me they were first designed as a transition to barefoot running, but now they’re targeted at a new breed of minimalist runners. ‘Minimalist runners?’, I said. I bent and squished the shoes with my mind fixated on how little room they’d take in my pack. The salesman went on to say that the lack of support allows your foot to build its stabilizing muscles and work out its own running form and blah blah blah. It sounded like dubious rationalization, but it didn’t matter, my obsession with traveling light took over my moderate interest in comfort (yes, I was just like those girls who wear mini-skirts in sub-zero temps). Then, the deal got even better. Because these are ‘minimalist’ shoes that basically do nothing for you except protect your sole from rocks, they don’t take much effort to make and so they’re by far the cheapest shoes in the Nike lineup. Woohoo! I’ve been running in them for over 3 months now and they’re brilliant. The first few days were a little sore, but now I’m doing 8km regularly and plan to wear them in a 10km race this Sunday (the World10k in Bangalore, India). More than anything though, these puppies take up very little room in my pack because they squish right down and can flex any-which-way. They’re seriously up there in my top 5 best purchases ever. Lauren and I love the winter. Not the sort that hovers around 10 degrees and gives everyone head colds. But the type that involves lots of snow and such low temps that you get a taste for the precipice where life meets death. Okay, maybe that’s a little dramatic, but we do like winter sports and even living in the alpine environments for short periods. This is where it gets tricky though. And this is where the lightweight traveler typically has to plan his/her travels with equipment and clothing in mind. I find the best strategy is to space out winter encounters so your all-around summer shoes (such as my Keens) are ready for replacement. That way you can ditch the summer shoes (keep the Nike runners) and buy a winter all-rounder. Unlike the summer, there are distinct shades of winter. There’s city living that just requires a closed shoe and a pair of socks, then there’s mountain living that requires a mid- or high-cut boot, Gore-tex liner, double socks, and tight laces. The real problem is, what to do with the shoes or boots when you leave? I tried sending my Scarpa boots home and having family send them back, but it was prohibitively expensive. So usually you’re left with having to buy suitable shoes and either sell, donate or carry them afterward. Keep this in mind when you go shopping. That pair of Sorels might be all the rage in downtown New York, but you won’t want to donate them after spending so much and they’ll take up your entire pack when not in use. I suggest buying a low-cut lightweight closed travel shoe with a similar principle to the Keen sandals for summer. That is, a pair suitable for adventure and less casual situations. Then when you move on, they can tie to your pack until you find a buyer or worthy recipient. If you think another winter jaunt is on the horizon, it may pay to cart them around. Instead of buying another pair again in a few months. I thought about buying a closed shoe for summer that could also last in winter. You really don’t need much for winter if you’re used to traveling and adapting constantly. One of my cousins in Canada rarely wears gloves, boots or a winter hat even when it plummets to 20 below. Lauren just wore runners in 20 below too when we were last in Canada. So you really don’t need boots unless you’re climbing or somewhere with serious snow issues (Alaska or Siberia). This time around I opted to go for a summer sandal because we plan to stay a while in very hot climates. Recently in Delhi, it was 40+ degrees every day; that’s not the sort of weather for restrictive shoes. That said, a closed summer/winter low-cut shoe would certainly take the hassle of buying/ditching specific winter shoes each time we head North around Christmas. I think for most of us though, we tend to travel around warm parts of the world, and when we do go somewhere cold, it’s much less often and the additional purpose isn’t such a big deal. That’s at least my situation this time around, but I suspect as soon as I leave Asia, it will make much more sense to go for a closed summer/winter travel shoe.